Whether you're driving cross-country in a car or taking a long-distance ride on a motorcycle, we've got some clever travel ideas that you won't see anywhere else! 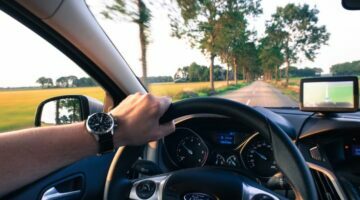 Here, frequent roadtrippers are sharing their favorite driving tips (for RVers, motorcyclists & new drivers), fun road trip ideas & games to play while driving, and lots of unique road trip ideas -- where to drive to see beautiful fall foliage, amazing bridges to put on your road trip bucket list, and the best road trip planners to start your trip with. Here are details of our 2-week trip from Nashville, Tennessee to Edmonton Alberta Canada… in an RV. This is part one which sort of sets up the trip. More fun photos and details to follow. What Do I Know About License Plates? This list is updated regularly to reflect the latest pageviews and Comments, as well as others’ links to the articles which appear in the Car & Driving category at TheFunTimesGuide.com. An Oversize load can be anything that will fit on a truck — towing a trailer or a low loader — that is wider or longer or higher than a normal gauge semi-trailer. Here’s what it’s like to drive a truck that hauls oversized loads… according to Andrew from Australia, who does this for a living. 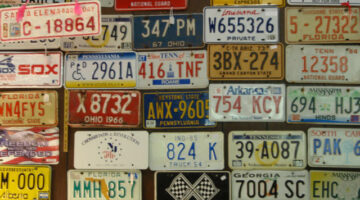 Now you can report the license plates of bad drivers and post them online at Platewire. And you aren’t limited to sharing just the ‘bad’ drivers. You can also let everyone know who the ‘good’ drivers and the ‘cute’ drivers are… Say what you want to say about the driver of a car with any license plate here. It’s a great release to vent your frustration over a run-in with a bad drivers. Wide Load… Tall Load… Big Load… It’s A Boatload! Here’s a classic example of the types of ‘wide loads’ you see traveling down the highways. Plus, some little-known facts about height clearances on wide and tall loads being transported via tractor-trailer. Hmmmm…. interesting! Talk about big tires… These are some serious meats! …Even MORE Games Played While Driving! Fun driving games to play on long car rides, road trips, family vacations, or whenever you’re stuck in traffic. These car driving games can be enjoyed by the entire family! The International CXT pickup truck is definitely one of the coolest big boys toys around! Here are International CXT truck photos. Here are some things you can do to avoid hitting a deer in the first place… and how to minimize the damage if you do. Plus a few funny things about deers and hunting. 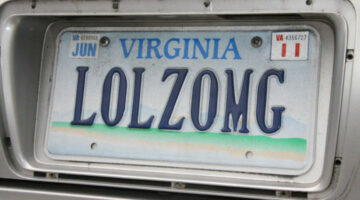 Is Your License Plate Expired? If it is, and I’m in your town, you can bet I’ll notice it! For some odd reason, I’ve always (since college) checked the license plates on the cars in front of me to see whether they’re expired or not…. What ‘Games’ Do You Play While Driving? We’ve always played car games for adults like the ‘license plate game’ while driving on long trips. I’ve heard that others play ‘poker’ with their speedometer, or ‘dashboard Scrabble’ using letters found in the car. What games do you play while driving? Here’s everything I know about games to play in the car and how to play them. 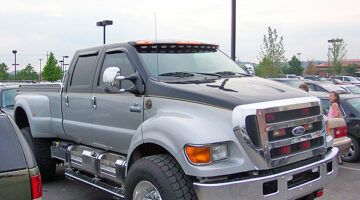 Have you spotted a Ford F650 monster truck in YOUR neighborhood. Here are some rare sightings… with photos of Ford F650 Super Trucks. Here’s a fun way to impress your friends the next time you pass a car with Indiana tags on it. 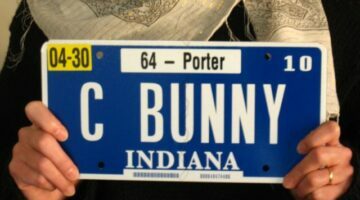 Proof that Hoosiers are smart people for this reason alone: They don’t need to have the county printed on their license plates in order to know exactly where in Indiana a particular driver is from! Here’s how the Indiana licenses plate numbering works.